Didn’t get out today. Too many clouds! Tomorrow should bring some light? I thought a shot I took a few years ago in Death Valley would be interesting. This is the “Devil’s Racetrack”. It is what is called a “Playa”. A flat lake bottom. Very flat! I think Playa’s are the flattest known natural occurring formations! A unusual event occurs on this Playa. Rocks move! Thats right,rocks move around on their own! You can see the trails left by these moving rocks all over the place!. I saw trails that were hundred’s of meters long & the thing is…………….nobody has ever seen them move! You also need to know that this location is remote. It takes several hours of driving on very dusty & at times bumpy, roads! So It’s not like anybody is out there to witness this activity! I even think a rock weighing over 700 lbs was found! They named it (Katie?) There are hundreds of these rocks all over the Playa with distinctive trails left running here & there all over the Playa. I was told by a park geologist that during the Winter, Death Valley gets these strong rain storms. It almost never rains in the desert but when it does,the water is always damaging! The Playa gets wet and changes from being very hard, to be very soft & slippery. Come night time,the temperature drops and creates a huge ice rink! All the stones are lifted up by this thin layer of ice. The final parameter is the wind! Some of these Winter storms can have very strong winds! So the theory is that the very strong winds push these rocks like “Curling” stones! The mud does not freeze totally. The mud must remain flexible enough to allow impressions to be left,but still very slippery! I picked up some soil & spit on it. I rubbed it between my fingers and it became like grease! I think I would like to see something like this! I even came up with a crazy idea on how to record this unusual phenomenon! Put a object that will glide (maybe a metal disc?) on the Playa with a GPS unit on it. Than have several cameras (with infra-red capability) on tall poles at strategic spots around the edges of the Playa. These cameras would require solar cells for power. Than put a motion sensor on the metal disc. When this sensor detects movement,it sends a RF signal to the cameras to start recording. 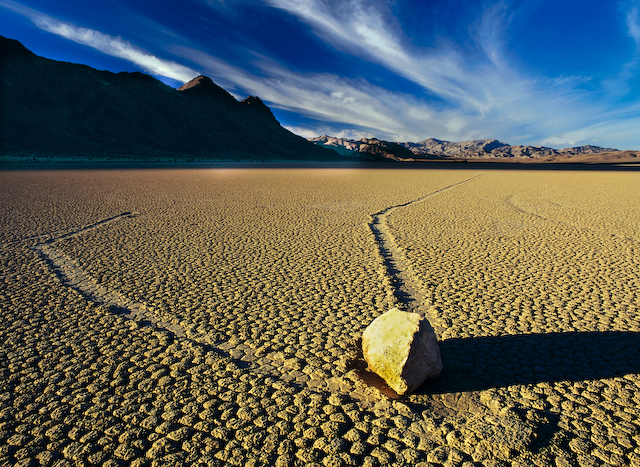 The Devil’s Racetrack was a fascinating spot to photograph! Very quiet! No wind,no birds,no sounds! I could hear the blood coursing in my ears. It’s one of those place’s that a person would always remember!